The Ultimate Sports Wrap is so much more than a stadium blanket - perfect for those cold and rainy game days. Water repellent outer shell and cozy fleece lining...complete with built-in mittens and hood. 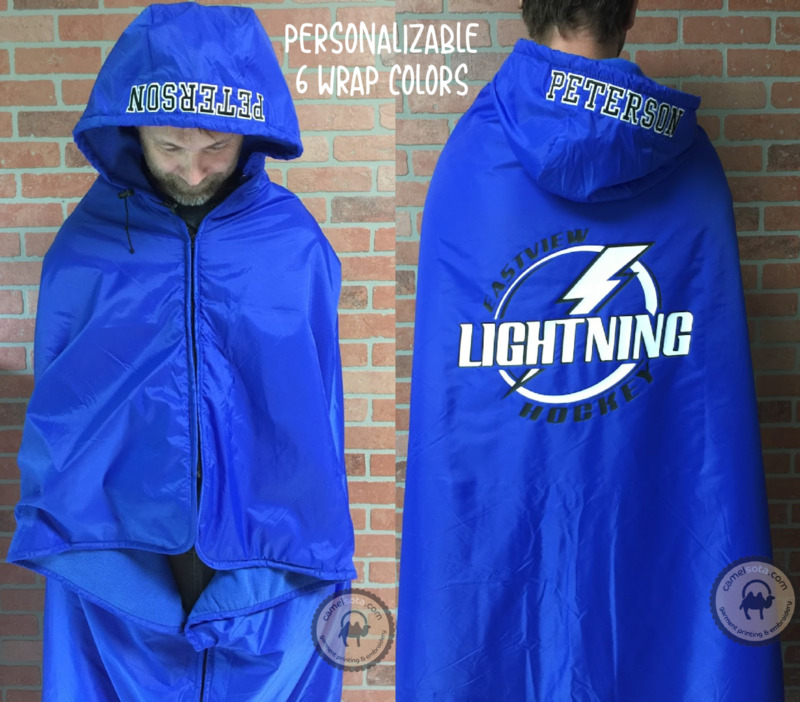 Zip yourself in and be totally protected from chilly wind and rain...all while looking great in your team colors. Add your team logo and be the envy of all the fans! Volume discounts available for 6+ wraps, if your team decide to order as a group. Your logo would be approximately 12" X 15" thermo-transfer applied to the back of the wrap. The logo can have max 3 colors. A name can also be embroidered on the rim of the hood or the front left chest or left front pocket (angled). Names are approximately .6"-1"H in size, depending on name length. Stock wrap colors are in the photos. Custom colors also available. Stock wrap size 70"W X 58"H. Made to fit average size adults under 6', and not exceeding 225 lbs. Custom larger sizes also available. The outer shell is made of 100% nylon denier, with a water repellent, urethane backing. Great for rain, sleet, snow and wind protection. The lining is 100% polyester, non-pill velour fleece. Soft and supple, it feels great against the skin, while keeping you warm and cozy. Washing Instructions: Wash with warm water, and hang dry (no dryer).